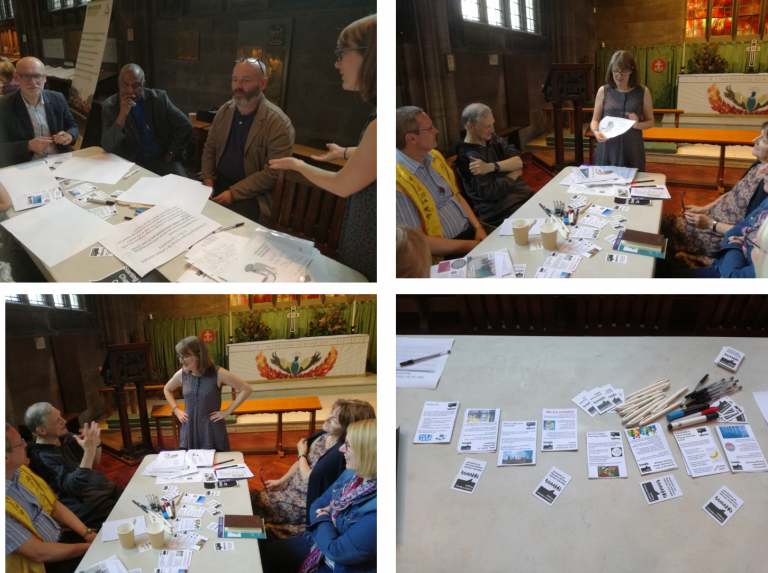 On the evening of the 7th June, faith communities across Greater Manchester came together in Manchester Cathedral to discuss climate change action. Fueled by fantastic food from HM Pasties, participants had the opportunity to take part in climate action workshops and be inspired by incredible speakers such as Anisha Minocha, a 15-year-old student (and now climate activist!) from Altrincham. Anisha spoke from the perspective of her generation, who will see the effects of our carbon emissions on their future climate. In previous Our Faith, Our Planet events we have identified that the values of all major global religions align with climate change action. Stewardship of our planet is very much about ensuring a stable climate and society for the next generation to grow up in. This event was about how we can take action to create change in our communities and how we encourage others to reduce their impact on the planet. Participants chose three mini-workshops on climate action to attend during the event, workshops were hosted by Groundwork, Greater Manchester Community Renewables, Christian Aid, and others including The Carbon Literacy Project. The Carbon Literacy Project ran a short ‘Higher or Lower: Guess the Carbon Footprint’ game, which is a key exercise in many Carbon Literacy training courses. The idea of the activity is to ‘test’ the participants’ carbon instinct and discuss which of the items and activities carbon cost surprised them. In our workshops, we also discussed what we can do as individuals right now. With this in mind, we asked the workship participants to take home one of our ‘action cards’. Each card detailed a significant climate action and advice on how to go about it. The action would either make a significant reduction in that individual’s carbon footprint or help spread the word about climate change and what we can do about it. The actions were based on examples created by participants of Carbon Literacy training courses over the past few years. The most popular action card taken was the ‘Have two meat-free days a week’ card. Another card explained how to switch to a renewable energy provider and save money at the same time (Click here to find out more on the Big Switch). We also discussed how each individual could go back to their faith community and encourage others to learn about climate change and take action as a group, including creating Carbon Literacy courses specifically for their faith communities. We are looking forward to hearing back from those who took part in our workshop on how they got on with their individual actions and how they have taken climate change learning and action to their communities.